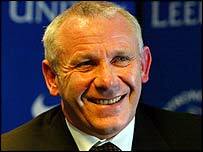 Peter Reid has been confirmed as the manager of Leeds United until the end of the season. The job was vacant after the Elland Road club parted company with Terry Venables on Friday morning. Reid was then unveiled as the new Leeds boss and he said he hoped to get the job full-time. "I'm going to have a good crack for the next eight games but you would have to be mad not to want to manage Leeds United," he said. Reid said he "snapped the chairman's hand off" after being offered the job. He compared the short-term appointment to the task he took on at the start of his Sunderland reign. "About eight years ago the same thing happened to me at Sunderland - it is an honour to be able to take over." He said it was a surprise to be asked, adding: "It was a pleasant surprise - I'm delighted. I want to get among the players because there are good players here and try to get a few results. "I'm back in football and I couldn't ask for anything more. When you love the game you just love the game and I am delighted to be in charge at such a prestigious club." Reid said he had been given no promises as to whether he might get the job full-time in the summer. He will keep Brian Kidd and Eddie Gray - the backroom staff for David O'Leary and Venables - and vowed to restore David Batty to the squad after the former England international was ignored under the old regime. Reid enjoyed a seven-year spell in charge of Sunderland, but left The Stadium of Light last October after their poor run of form. Leeds chairman Peter Ridsdale said he was thrilled to get his man. "Until yesterday Leeds United did not know it was looking for a new manager," Ridsdale said. "The conversation I had with Peter was 'let's get through the next eight games' and then take stock. "That is not a slight on Peter's managerial record - I am delighted that someone of his calibre was prepared to come in for eight games." But John Boocock, chairman of the Leeds United Supporters' Trust, said: "I cannot see Peter Reid as being a popular choice with the fans. "This appointment will go down like a lead balloon. The fans just don't like him. This is just going from the frying pan into the fire. "The club should have gone with Eddie Gray and Brian Kidd. "The fans would have been right behind Eddie because he is, and has always been, popular." "There's a lot of talent here"
"I'm delighted Peter was prepared to take on the challenge"